Internal battery that can provide up to 4 hours of connection without being plugged into power. 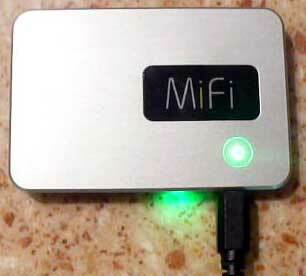 There are two ways to check the status of the MiFi 2200 remotely and physically. When physically checking the status of the MiFi 2200 you have two lights on the unit, a rectangular led on the edge of the unit (Service Status Indicator LES) and a round circle on the top (Power Button and LED indicator). When the green light is turned off this means the unit is turned off. If this light is slowly blinking the MiFi is turned on but there is no signal. When it is intermittently blinking the unit is in normal operation and is connected to the internet. Red Light – The battery is just about dead and needs to be recharged. Blinking Amber Light – The MiFi 2200 is experiencing a error, you will need to check the troubleshooting section and will likely need to reset the modem. To remotely check the status of the MiFi 2200 you have to first be connected to the unit either by wifi or by the wired USB connection. Open up a browser and type http://192.168.1.1 into the url bar and hit enter. This should bring up the general information screen (Welcome Page) and the login button. Viva sends out the MiFi 2200 configured for security but you can change the password and mess with other security features after logging in. The dark bar on the top shows you when you are connected. You will see “Disconnected”, “Dormant” or “Connected” to the right of “Viva EvDO Rev 0”. Below is a box with information on your internet connection. The “Received” and “Transmitted” numbers just lets you know information is being sent back and forth from the wireless tower. Below that you will see the connection time. To the right of this you will see other information that is used between your MiFi 2200 and the Viva’s internet service tower. Profile – This should say secure, if it doesn’t you need to check your security setting. This is important. If your WiFi is not secured anyone can access your internet taking up your bandwidth and it is possible someone can assess information on your computer. Security – Tells you what form of wireless security you are using. You can choose between different periodicals and sometimes this is need when you are trying to hook up an older computer that cannot use the latest periodicals. It is usually best to just leave is on its default. Users – You can have up to 5 users connected wirelessly to the MiFi 2200 the number to the left of the slash tells you how many are currently hooked up. The number to the right shows the maximum number that can be hooked up (5). If the number to the left is greater than the number that should be connected then someone may have access to your internet and it would be best to change the password so that your internet remains secure. You will rarely need to know the IP Address and the Mask other than the fact that the ip address is the number you used in the browser URL bar to access the admin section of this Modem/router. If the power LED flashes amber or the modem/router appears to be locked up it is likely that you will need to reset the unit. There is a small hole on the bottom of the unit where you can insert a small object like a paper clip. Gently push the paper clip into the hole and hold for 6 seconds the unit should now be reset to the factory setting, this includes the passcode. If time the battery does wear out so the unit allows you to change out the battery when it gets old. Another advantage to this is that if you need more than the 4 hours of wifi you can keep spare batteries charged and exchange them as needed. The factory says that you can get 54mbs from your Modem/router. What is actually get will be muxh slower and will depend on the service you are paying for, what is available, how congested the service is, and how far you are from the tower. I am currently getting about 1mbs from my MiFi 2200 in Jarabacoa Dominican Republic. Likely you will get a little better speed in Santo Domingo or Santiago. 1MB seems to be pretty common up in the hills. I think it speeds up a little when you get down into the main part of the town. This modem is pretty cool when you have power that shuts off frequently. It keeps on working with it’s back up battery.